A patient and never less than gripping character study that serves as a reminder of the emotional intimacy achievable on film. 99 min. The Weinstein Company. Director: Tom Ford. Cast: Colin Firth, Julianne Moore, Nicholas Hoult, Matthew Goode, Ryan Simpkins. 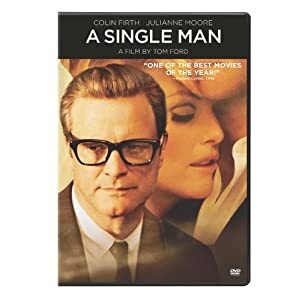 The title of A Single Man—Christopher Isherwood's novel and now a cinematic adaptation by first-time director Tom Ford—can be taken a couple of ways. Middle-aged professor George Falconer is unmarried, suspiciously so, making "a single man" euphemistic code for "a gay man." Since he's still reeling from the death of his lover eight months prior, George is also coping with actually being single for the first time in sixteen years. And then there's the story's elegantly contrived singular focus: just one day seen from the point of view of just one man, whose brief encounters with neighbors, a stranger, a curious student and a lifelong friend chip away at his insistence that life is no longer worth living. Set in 1962 Los Angeles, A Single Man is a patient and never less than gripping character study that serves as a reminder of the emotional intimacy achievable on film. Colin Firth gives a career-redefining performance as Falconer, an expatriate Brit drifting through his own personal hell. It helps that the times have caught up to Isherwood's story, with a broader audience ready to hear and understand Falconer's plight as a closeted man. "It takes time in the morning for me to become George," he narrates. "Time to adjust to what is expected of George and how he is to behave...I know fully what part I am supposed to play." Though he flirts with the secretaries at the college, hedges his words in his English lectures, and literally lives in a glass house, George's act mostly plays out as a mutual agreement with others not to discuss the obvious. This cultural detente faces its greatest strain when (as seen and heard in a flashback) a relative of George's partner Jim calls to inform George that Jim has died in a car accident, saying only "I thought that you should know" and that the funeral is "for family only" (Mad Men's Jon Hamm supplies the vocal cameo). The particular, eventful day of George's life that A Single Man essays he has determined will be his last. Meticulously, he gets his affairs in order and, in black comic style, attempts to get comfortable to do the deed with a gun in the mouth. But, more than once, he allows himself to be distracted. He teaches a final class—ostensibly on Aldous Huxley's After Many a Summer, but actually a frustrated, subtextual plea to abandon fear and adopt an open-mindedness to "the somehow invisible minority." One student has been waiting for just such an opening: Kenny (Nicholas Hoult) regards his teacher with a searching empathy and seems to see right through him; the lad's determination to break through George's defenses may just be greater than the man's determination to avoid people and abandon life. And then there's George's boozy bosom buddy Charley (Julianne Moore), who knows her friend is gay but has never gotten over her handful of youthful bedroom encounters with him, the witty and urbane "man who got away" from her; her blazing need for companionship also gives George pause. Ford, who comes from the world of fashion, comes close to overdosing on style (with misplaced Hitchcockian allusions), but ultimately comes down in favor of letting his leading man simply devastate us with his understated powerhouse of a performance. It also helps that most of Ford's sensuous stylistic flourishes are used to clear and effective ends: a poetic representation of George's emotional sensation of drowning, a slo-mo evocation of George's stolen-glance male gaze, and a picture-long scheme of boosting color for moments when George's drained existence, against the odds, momentarily sparks back to life. To a one, A Single Man's characters are vivid and thoughtfully embodied by a strong ensemble. Moore can do no wrong; she's positively brilliant in playing out Charley's adaptive but achingly sad emotional strategies to win George as her own. Hoult strikes just the right notes in the goodhearted Kenny's bittersweet slow dance of seduction with George. And in his flashbacks as Jim, Matthew Goode crucially convinces us of the charm and love that George can't live without. 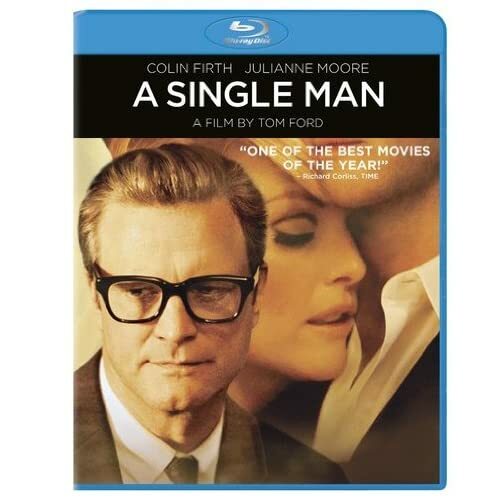 A Single Man reaches a climax that's both hopeful and haunting; it's a most welcome thinking person’s picture about love, loss, and the mortal ravages of inexorable time. In its Blu-ray hi-def incarnation, A Single Man is positively lush in sight and sound, losing little (if anything) in the translation from theaters to home theaters. Sony consistently delivers the sharpest transfers in the biz, even with potentially problematic material like A Single Man, with its delicate color shifts and nighttime beach excursion. Without losing a film-like appearance, the transfer is sharp and textured, maintaining shadow detail and rendering precisely accurate color; you'll hear no complaints about the DTS-HD Master Audio 5.1 mix, either, with its definitive lossless presentation of crisp dialogue, ambience, and Abel Korzeniowski and Shigeru Umebayashi's voluptuous music. The disc includes a thorough commentary with producer/director Tom Ford, who explains his every concept and his execution of same, as well as his experience as a neophyte director tackling the production's various demands and working with his experienced cast. "The Making of A Single Man" (16:07, HD) is a standard-issue featurette, with some thoughtful interpretations from the talent. Ford delivers what feels oddly like a scripted talking-head interview, but we also get insightful comments from Colin Firth, Matthew Goode, Julianne Moore, and Nicholas Hoult. For Blu-ray, Sony also includes BD-Live connectivity, including movieIQ. All site content © 2000-2019 Peter Canavese. Page generated at 04/21/2019 06:19:58PM.